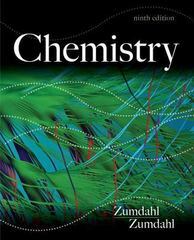 Chemistry 9 Edition This fully updated Ninth Edition of Steven and Susan Zumdahl's CHEMISTRY brings together the solid pedagogy, easy-to-use media, and interactive exercises that today's instructors need for their general chemistry course. Rather than focusing on rote memorization, CHEMISTRY uses a thoughtful approach built on problem-solving. For the Ninth Edition, the authors have added a new emphasis on critical systematic problem solving, new critical thinking questions, and new computer-based interactive examples to help students learn how to approach and solve chemical problems--to learn to think like chemists--so that they can apply the process of problem solving to all aspects of their lives. Students are provided with the tools to become critical thinkers: to ask questions, to apply rules and develop models, and to evaluate the outcome. In addition, Steven and Susan Zumdahl crafted ChemWork, an online program included in OWL Online Web Learning to support their approach, much as an instructor would offer support during office hours. ChemWork is just one of many study aids available with CHEMISTRY that supports the hallmarks of the textbook--a strong emphasis on models, real world applications, visual learning, and independent problem solving. Available with InfoTrac Student Collections http://gocengage.com/infotrac.